ADULT MINISTRIES LECTURE SERIES – Sunday, May 21, 2019 at 12:30 in the Parish Hall. Speaker: Fr. Stephan Bigham. Theme: First Off, Wake Up! See Poster for complete schedule. ТНЕ SACRAMENT OF CONFESSlON COMMUNlON Confession is heard every Sunday morning at 9:30 аm or 30 minutes before апу Liturgy during Great Lent. VISITING SICK - Please note that Fr. Volodymyr is visiting parishioners in hospitals and nursing homes on Wednesdays. 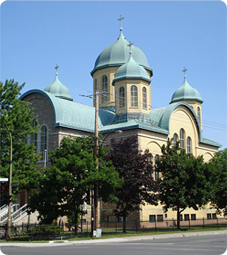 If you know of any parishioner or you would like him to visit you, please call him at 514-947-2235 to arrange a time. ANNIVERSARY BOOKS – are available to be picked up on Sundays from 12:00 – 1:00 pm in the Parish Hall.